Take a stand for L.A.’s tree. Our iconic palm trees are under attack. Some early 20th century specimens are near the end of their life span and folks want to replace them with new species… Sure they don’t provide much shade, and sure most of them came from someplace else, but they’re still our pride and joy. Hollywood neighbors were outraged when developers building a new Target near Sunset and Western chopped down a stand of 100-year-old Canary Island date palms earlier this year. 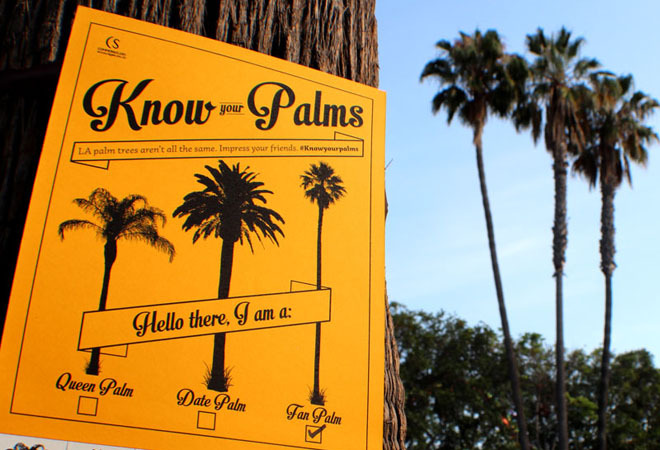 Well, on the brighter side, the fine folks at COMMON studio have created Know Your Palms, a project to inspire folks to look up and enjoy the palms in Palms. Their series of art posters hung through the west side neighborhood offer a guide to the plentiful species and a souvenir tear-off to remember your trees by. Send them $16 bucks and you’ll get a lovely screen-printed poster and proceeds help save L.A.’s favorite tree.